Join Us!!! We are looking for someone to help us cover Africa Basketball League men basketball. Please send us an e-mail. 1 De Agosto stormed past Petro de Luanda to advance into Final Four. The game was mostly controlled by 1 De Agosto. Petro de Luanda managed to win second period 18-13. But it was not enough to take a lead and get a victory that evening. 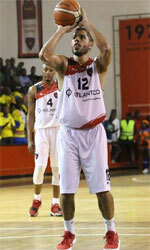 They dominated on the defensive end, holding Petro de Luanda to just 7 points in third quarter. 1 De Agosto dominated down low during the game scoring 42 of its points in the paint compared to Petro de Luanda's 20. 1 De Agosto had a 30-19 advantage in offensive rebounds. Dominican-American point guard Emmanuel Quezada (188-85, college: USF) orchestrated the victory by scoring 11 points, 7 rebounds and 9 assists. 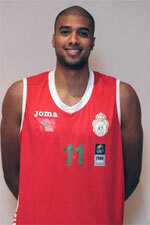 Forward Felizardo Ambrosio (202-87) contributed with 20 points for the winners. Four 1 De Agosto players scored in double figures. Portuguese-Angolan guard Carlos Morais (200-85, agency: Duran International) replied with 14 points and 5 rebounds and forward Leonel Paulo (197-89) added 11 points in the effort for Petro de Luanda. Both coaches used bench players which allowed the starters a little rest for the next games. Somouha held off Al Ahly to seal their semifinal berth. The hosts took control from the first minutes by winning first half. But Al Ahly won fourth quarter 19-18. However it was not enough to take a lead and get a victory that evening. Somouha made 22-of-27 charity shots (81.5 percent) during the game. Their players were unselfish on offense dishing 22 assists. Nigerian-American center Augustine Okosun (209-86, college: Keiser) had a double-double by scoring 23 points and 12 rebounds to lead the charge for the winners and American point guard James Justice (178-89, college: Martin Methodist) chipped in 23 points and 10 assists during the contest. American-Armenian center Todd OBrien (211-89, college: UAB) responded with a double-double by scoring 17 points and 17 rebounds and American guard Reginald Holmes (193-87, college: Morgan St.) scored 18 points. Both teams had four players each who scored in double figures. Both coaches tested many bench players and allowed the starting five to rest. AS Sale topped Defenders to secure the next round berth. The game was mostly controlled by AS Sale. Defenders managed to win second period 30-27. But it was not enough to take a lead and get a victory that evening. They made 18-of-21 free shots (85.7 percent) during the game. AS Sale outrebounded Defenders 37-25 including 27 on the defensive glass. Power forward Abderrahim Najah (198-84) notched 27 points and 9 rebounds (on 10-of-12 shooting from the field) to lead the effort and American swingman Wayne Arnold (198-84, college: Tennessee St.) supported him with 18 points and 8 rebounds. Five AS Sale players scored in double figures. Even 19 points and 7 rebounds by forward Ocheibi Okpe (197-90) did not help to save the game for Defenders. Guard Adottah Adottah (185-92) added 6 points, 9 rebounds and 4 assists for the guests. Both coaches allowed to play bench players saving starting five for next games. JS Kairouan nipped ES Rades to sweep the series. ES Rades were ahead by 9 points after three quarters before a 27-17 charge of JS Kairouan, which allowed them to win the game. They made 22-of-28 charity shots (78.6 percent) during the game. 26 personal fouls committed by ES Rades helped opponents get some easy free throw opportunities. The best player for the winners was Senegalese-Spanish center Maodo Nguirane (210-93) who scored 15 points, 6 rebounds and 4 assists. Forward Jawhar Jawadi (189-97) chipped in 16 points. American guard Deondre Parks (185-92, college: S.Dakota St.) produced 22 points and Mohamed Hadidane (207-86, agency: 011 Sports) added 9 points, 9 rebounds and 5 assists respectively for the hosts. ES Rades' coach rotated ten players in this game, but that didn't help.